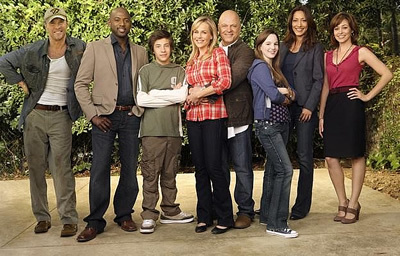 Performers include: Michael Chiklis, Julie Benz, Autumn Reeser, Jimmy Bennett, Kay Panabaker, Tate Donovan, Christina Chang, and Romany Malco. This science fiction/drama centers on a typical American family which, for various reasons, seems to be breaking apart. While on a trip, their plane crashes in the Amazon River and each member gains special super powers. Before the crash, Jim Powell (Michael Chiklis) was a failed artist who used his skills as a police sketch artist, but felt he wasn’t contributing much to the world. Additionally, he felt like his family was growing apart. He’s happy for his wife’s success, but it only seems to make his own contributions that much much less significant. After the crash, he finds he has super strength and gets excited, turning himself into a superhero of sorts. Assistant District Attorney George St. Cloud (Romany Malco) is Jim’s best friend since college. Jim trusts him with his new secret and George finds a way for the two of them to make a difference in the world. Jim’s wife, Stephanie (Julie Benz), is the new young Executive Vice President of Research at Global Tech. She has an eighty-hour work week and that doesn’t leave her a lot of time for her family. She feels Jim slipping away from her, but doesn’t know how to fix their relationship. It was he that suggested she turn her business trip into a family vacation, so she went along with it. Since the crash, she’s acquired the power of super speed, something that will definitely aides her in spending more time with her family. Dr. Dayton King (Stephen Collins), is Stephanie’s boss and mentor, but he has his own secrets. Katie Andrews (Autumn Reeser) is a lab tech at Global Tech and friend to Stephanie. She’s always been an outsider and as a kid disappeared into fantasy and comic books. Katie’s always wanted to be appreciated by Stephanie, and once she finds out her friend’s “super secret,” she sees it as an in. Daphne (Kay Panabaker), Jim and Stephanie’s daughter, is an intelligent, beautiful teenage girl, who is happy and somewhat popular. After the crash, she finds she can hear everyone’s thoughts. Daphne begins to struggle socially when she tries to act normal and can’t control her super power. Daphne’s younger brother, JJ (Jimmy Bennett), has felt like a disappointment his whole life, feeling like he’s in the shadow of his very successful mom and smart sister. He accepted that he was the dumb one in the family. With his own super power, he becomes a genius and finds he can now solve complex equations with ease. JJ hopes his parents can finally be proud of him. Flames streak through the sky. Into frame comes the source of the fire: A jumbo jet hurtling to the ground. Inside, its passengers pray for their lives. Among them we find George St. Cloud. Flashback to one day earlier: Litchfield threatens JJ for skirting Dr. King’s equations, but JJ brushes him off per usual. Global Tech CEO Helen Burton (formerly known as Mrs. X) gets wind of this failure and fires King from Global Tech. She wants the secret to power permanence and believes King’s feelings for Stephanie are clouding his means of dealing with her son. Jim, furious by Litchfield’s treatment of JJ, goes to school to confront him. Instead of the usual, willful and annoying Litchfield, Jim finds a dead Litchfield. Death by electrocution tips Jim off to the fact that Litchfield must have met a super before he died. Meanwhile, George helps Katie prepare for the baby’s arrival. Things are sweet between them until Joshua returns after being gone for months and crashes the party. Jim calls home to warn the family about Litchfield, but the power goes out and they are disconnected. JJ goes outside to reset the circuit breakers, but is electrocuted by a man in a black suit. The man that killed Litchfield kidnaps JJ. Once the family realizes JJ’s gone, George runs Litchfield’s phone records which leads them to King. Stephanie and Jim go after King. King promises he doesn’t have JJ but he’ll help them find him if they give him one thing in return. He needs an injection of the Trilsettum serum. It’s the only thing that’s kept him from dying of cancer for the past 18 years. Both he and Helen are after power permanence. He needs it to stay alive, she needs it for less humane purposes. Speaking of inhumane, Helen’s crew holds JJ hostage and they’re not letting him go until he explains why he and the other Powells have permanent powers. He’s stuck in his prison cell until he figures it out, but at least he’s sharing quarters with an old friend: Joshua. Joshua and JJ brainstorm the source of the Powell’s powers. Joshua admits to loading their cargo plane in Belem with Trilsettum vials right before it crashed. The Trilsettum fumes would have been intense but not enough of a variable to cause permanence. Joshua wants to know how Katie is. JJ says she’s fine, besides being pregnant. JJ realizes this is the first time Joshua learned he’s going to be a father. George goes to refill a prescription with Katie’s doctor, but her record is not on file. Dr. Klein says he was mugged at the time of Katie’s alleged appointment so there’s no way he could have seen her. George reviews the security footage of Klein’s mugging and sees our sultry shapeshifter Victoria Marrow steal Klein’s identity. George calls Katie and warns her Joshua too is not who he seems. Jim, Stephanie, and Daphne follow King to Helen’s facility in order to break JJ out. Using their combined powers, the trio makes their way past the guards, advancing through the facility until they are met by the man in the black suit. He hits Jim with powerful beams of electricity, but Jim’s strength and determination to find JJ overpower the villain. Jim reverses the rays and Electro-man ends up fried. Nothing can stop our powerful family it seems, but then a noxious gas conks them out in the elevator. Daphne and Stephanie awake in a cell. Helen enters explaining she’s gone through the trouble of blocking their powers: A radio signal blocks Daphne’s powers and Jim’s been dosed with his personal kryptonite, Cynoxate. She then brings in JJ and threatens to kill Daphne if he doesn’t think fast about the solution for power permanence. Fear crowds JJ’s over-sized brain. He hasn’t felt fear like this since the crash in Belem. And then it hits him – when the Powells were originally exposed to the Trilsettum in Belem, they were also on serious amounts of natural adrenaline. Helen’s serum uses synthetic adrenaline. Real adrenaline is the key to power permanence. Helen thanks JJ for his help, orders them to be shot, and then leaves. Before the guards can carry out their order, King saves them. He says he’ll rescue Jim while they stop Helen from making her 80 criminals permanently super. King frees Jim, then seizing his chance to take out the competition, he shoots Jim. Jim bleeds and goes down, weakened by the cynoxate. Satisfied with his brilliance, King catches up with Steph to bear the bad news. Back at Katie’s, Joshua morphs into Victoria, revealing herself and her plan to steal Katie’s baby. Katie tries to run, but Victoria throws her down, forcing Katie into an early labor. Joshua (the real one, freshly freed from X’s prison) busts in and rescues Katie. Heartbroken by unrequited love, Victoria runs away. George sees her flee and decides to follow her and get to the bottom of her reappearance. As King consoles Stephanie, Jim appears, back from the dead. King, now with no way out, admits he did it because he loves Stephanie. Of course, this only makes Jim angrier. Jim impales King with a flank of wood but King rises, completely unscathed and invincible. His strength overpowers Jim, his mind is impenetrable to Daphne’s attempts at mind control, he can even zoop like Stephanie. He can do everything they can do but better. JJ remembers that Joshua was powerless in his cell and that his mom’s antidote worked. Stephanie zoops to the lab and seconds later returns armed with the antidote. JJ uses smart-vision to calculate the correct trajectory and throws the syringe like a dart, piercing King. The serum instantly counteracts the trilsettum and King shrivels to death from the cancer inside him. Life in Pacific Bay begins to settle. Katie and Joshua have a new baby boy. Other than his slightly green glow he is perfectly healthy. George follows Victoria to the plane where Helen’s criminals are being loaded. A guard discovers George and, mistaking him for one of bad guys, forces him on board. Not long after take off, the plane begins to dive. As in the beginning of our story, the plane crashes and the passengers emerge anything but Ordinary. First aired: April 5, 2011. Don’t understand why this show was canceled i loved this show hope it comes back. Very disappointed, this was a very very good show. CANCELLED ,another show I love bites the dust, can’t say I’m surprised anymore. They keep terrible shows and cut the good ones. Just when i though ABC have the best tv show in U.S. they cancelled it. this tv show was my favorite show to watch. Bring it back! I’m ready to fight for quality programming. This is a show that displyed family values. The treatment of people with differences. This is a show I could watch with my kids and not be ashamed. What has happened to the moral attitude of tv execs? Stop cancelling shows with substance. Bring it back! I’m ready to fight for quality programming. I agree. I really never heard of the show, but once I really got into it, I enjoyed it a lot. Just when I thought ABC got it they cancelled one of my favorite shows in their network. I guess they still dont get it when they have an interesting show with a good plot with action, Mysteries excitng and some family value as a message. I do not know if they ever value the people who watch the shows. No ordinary family was my favorite show. Until I just now logged on, I had no idea it had been cancelled. You know, it seams to me, that if there is no filth in a show , it seams to get cancelled. What a shame. I looked forward to seeing that show every week! I dont know why you canceled this show but, everytime i get interested in a good show they always cancel the shows i like i am getting very disgusted anymore.That was a very good family show one that i havent seen in ages. As soon as i get interested in it there they go and cancel on me. I wish you would all put it back on please.Thank you from the Via family. No Ordinary Family was a good and decent show. I love this show!! My family watches it every night it’s on!!! Such a wonderful show! I can’t wait to see next season! !